A collection of more than seventy mouthwatering comfort food recipes using nutrient-rich, raw ingredients—a healthy, affordable, and accessible alternative to familiar processed and packaged foods. Can spinach really taste like chocolate ice cream? YES! Just try Stacy Stowers’s Happy Shake—cupfuls of nourishing greens, plus a dash of raw cacao, a big handful of blueberries, and a few other delicious fixings that you can blend up every morning and enjoy with a spoon! Stacy travels the country teaching families like yours how to add more whole, raw, unprocessed foods into their diets in the simplest, most satisfying way possible. Her clients soon discover they stop eating out of bags, bottles, cans, and boxes—and start feeling healthier, lighter, and more energetic. Eating raw is easier and tastier than you think. The gift of Stacy’s approach is that it’s not about becoming a “raw foodist” or joining some food religion; it’s about adding foods that will make you thrive. What are the potential benefits of eating raw? Weight loss and management, more energy, relief from chronic pain and allergies, better moods, and a younger appearance—to name just a few! From Stacy’s comforting and crispy Cheatos and enticing Rainbow Fajitas, to her rich, delectable Chocolate Macaroon Fudge Bars, her more than 70 recipes will give you and your family an irresistible nutritional boost. In 2007, Stacy Stowers realized a remarkable recovery from the debilitating effects of fibromyalgia and chronic pain after switching to a raw food diet. Now she tours the country living with individual families, and helping them to make the switch to a raw, nutrient-rich diet. When she’s not staying with her clients, she lives in New York with her family. 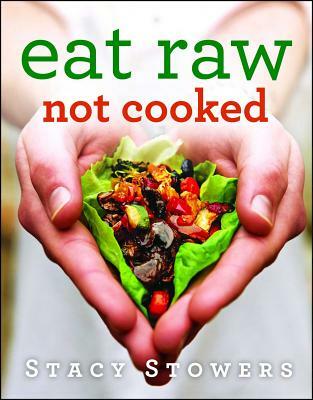 "It’s not a book on a mission butsimply one that advocates better choices for healthier living, along with 60recipes." "Unlike other raw-focused recipes, these super healthy meals and snacks won’t remind you of lawn clippings as soon as you take a bite. In fact, they’re downright delicious! The nutrient- rich grub is sure to please raw foodies and regular eaters alike."